As promised, I have created both a blog and newsletter featuring all the coordination and details that went into creating our beautiful display at Bride World Expo at the Los Angeles Convention Center. The bridal expo took place over the weekend of January 21st-22nd and showcased over 100 vendors, each exposing attendees to the latest trends in the wedding industry. I am excited to share my expo experience and help you plan your dream wedding that you, your family and all your guests will cherish for the rest of your lives! This was my first bridal expo participating as an official wedding planner. I worked at a similar expo six years ago as a makeup artist, but this was a deeper, more intimate event. At the expo, I was able to broaden my network and met with some amazing newlyweds who entrusted our team with coordinating their most special day of their lives. 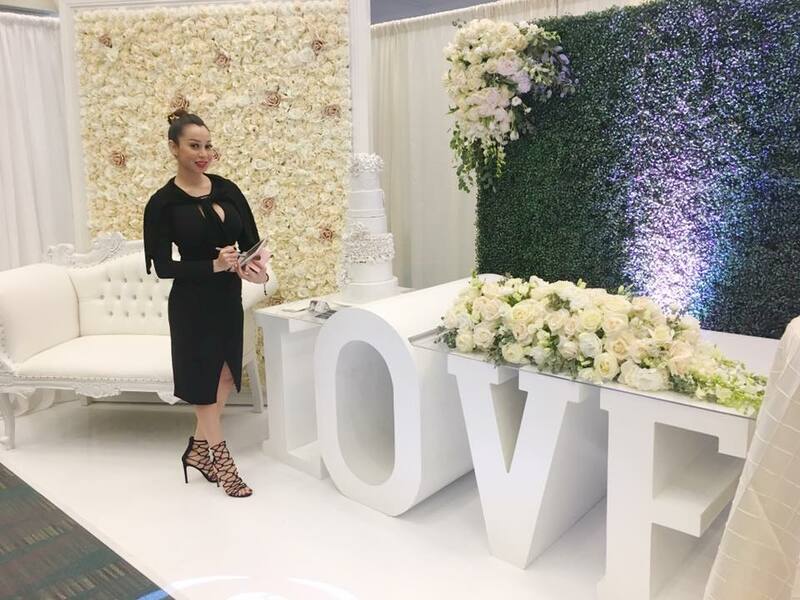 Talk about a “conversation piece” , this gorgeous prop set up by Imani Williams, owner of Platinum Prop Rental Props LLC, was an absolute show stopper at the bridal expo. All the attendees admired this set up and enjoyed taking pictures on the beautiful love seat accompanied by the beautiful flower wall. You too can enjoy this beautiful display at your wedding by allowing us to help style and coordinate your wedding day! As your personal event stylist and coordinator, it is my goal to make sure that all aspects of planning and attending your wedding are both manageable and enjoyable. Thanks to a recent collaboration, Illuminated Memories has allowed us to give our soon to be married couples the option of designing their own custom dance floor and up lights. Impress your guests with all around GOBO lighting. To make your first dance as newly weds nothing short of memorable, you can use more than one GOBO light to create custom patterns and monograms on your beautiful dance floor. Ultimate Music Entertainment is guaranteed to have all your guest grooving to the latest beats or to a custom playlist including songs of the bride and grooms choice. Above are just some of the sweet treats by our favorite bakers at Hers Bakery. Hers Bakery can customize wedding cakes to fuse with any colors or themes you have selected for your dream wedding. A vegan menu and custom wedding cakes are also available upon request. As an event stylist and former project coordinator for some of the top Beverly Hills plastic surgeons, I can understand how overwhelming planning and styling an event can be, let alone your wedding day. It is recommended that you hire a wedding coordinator, traditionally known as a “wedding planner”, for the most important day of your life. Hiring a wedding coordinator can eliminate the immense pressure of having to make everyone happy in such a short amount of time. There are a lot of people involved in a wedding production and sometimes things can be over looked. Even the simplest details of a wedding can be over looked If you don’t have one person dedicated to following up with the plans you initially made from the day you became engaged. What they don’t known about when you get married is that planning a wedding is full time job. While it is understandable that everyone is excited and wants to be a part of your wedding, taking everyone’s opinion into consideration is overwhelming. Let your personal wedding coordinator be responsible for making sure that even the smallest detail is up to par with the style of your wedding or event. Let me handle all phone calls that need to be made, potential bridal parties and even your wedding guests (soon to be in-laws included). It is my personal mission to ensure that everything runs smoothly. The end result of my mission is a reflection of our company and we consider ourselves perfectionists. Our company makes sure even the most minuscule detail is perfect; Is your wedding dress hanging from the hanger just right? Does the hanger even match the style of your wedding? With us on the job, that’s a “yes”. Our attention to detail is absolutely pristine when it comes to the style of your wedding photographers and videographers. Even in the area of photography, our expertise in aesthetics and detail coordination are greatly appreciated when producing beautiful and memorable wedding photographs and video. Our team of photographers, videographers, hairstylists and makeup artists are all professionally trained experts in high definition makeup and high definition productions. Leave the hair and makeup to the professionals. We are happy to put together a glam squad for the bride and bridesmaids. Our hair and makeup artists are familiar with high definition makeup and the latest trends in hairstyles. Hair and makeup trials are highly recommended to confirm that you are satisfied with your look on your wedding day. We would like to recommend our top makeup and hair stylist Jazelle Morales, Los Angeles’ best makeup artist. Transform your wedding into the ultimate romance novel by hiring Eric Chiu as your videographer and create magical memories that can be watched for an entire lifetime to come.